Bonus Features: A special message from the founders of Stott Pilates, review of the 5 basic principles behind the Stott Pilates, a trial next level workout, workout with music only, presentation of Stott Pilates equipment and other video titles, Meet the Instructors, facts about instructor training. Moira Merrithew, together with President and CEO of Stott Pilates Lindsay G. Merrithew, and a team of physical therapists, sports medicine and fitness professionals, has spent over two decades working on the Stott Pilates method to ensure it’s aligned with current scientific and biomechanical research. This clear and detailed approach forms the basis for Stott Pilates training and certification programs. John Garey owns John Garey Pilates in California and a Stott Pilates Licensed Training Center. He has been a fitness presenter for more than 15 years and has taught and motivated instructors throughout the world. He is a 1995 United States National Aerobics Champion and holds an MA in Adult Fitness from New York University. 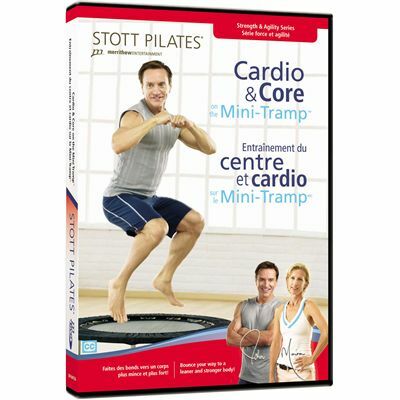 for submitting product review about Stott Pilates Cardio and Core on the Mini-Tramp DVD.